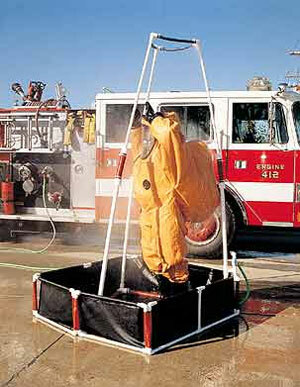 Fendall CompanyEmergency Decontamination Shower provides decontamination facilities on-site without distracting emergency responders from their primary task. This shower flushes contaminants from the workers' protective clothing while the retention pool collects the rinse water. The captured fluid, which may contain hazardous materials, may then be disposed of properly. Fully deployed, this shower stands eight feet tall, and has seven spray nozzles positioned in the top and around the sides of the unit. This provides for the complete drenching of the emergency responder or victim. Requiring no assembly, the pool and shower can be carried in bags, and one person can make the shower operational in less than two minutes.